I have always been a fan of things that make my life easier. I mean, who doesn't want to live a life of simplicity so they can spend more time doing super important things like saving the world and scanning Facebook? When it comes to prioritizing, food and cooking is high on my list, so it only seems natural that when something comes along that can make my life easier in the kitchen, I must have it. Enter the Instant Pot. I had a long love affair with my crockpot, but have since broken up with it for the Instant Pot. This guy is everything that the crockpot was...and more. The Instant Pot is a multifunctional electric pressure cooker. It can be used as a pressure cooker, slow cooker, yogurt maker, rice cooker, or steamer. My favorite feature is the saute function. You turn it on and can saute your onions, etc. before you put all the other ingredients in for cooking. This completely eliminates the step in so many slow cooker recipes where you have to cook stuff in a pan (like browning the meat) before you put it in the crockpot. Fewer dishes. A total win in my house. I have only used the Instant Pot as a pressure cooker, but it has been completely amazing at that job and was worth every penny even if I don't use it for anything else (note: it was a gift, so I didn't spend a penny on it, but even if I had spent pennies on it I would not be disappointed). If you are unsure about pressure cooking, think slow cooker, but faster. You can make anything that you would make in a slower cooker, faster. I've made several soups and stews, steel cut oats, spaghetti squash, and chicken curry all in under an hour. And they taste better than they do out of the crockpot! 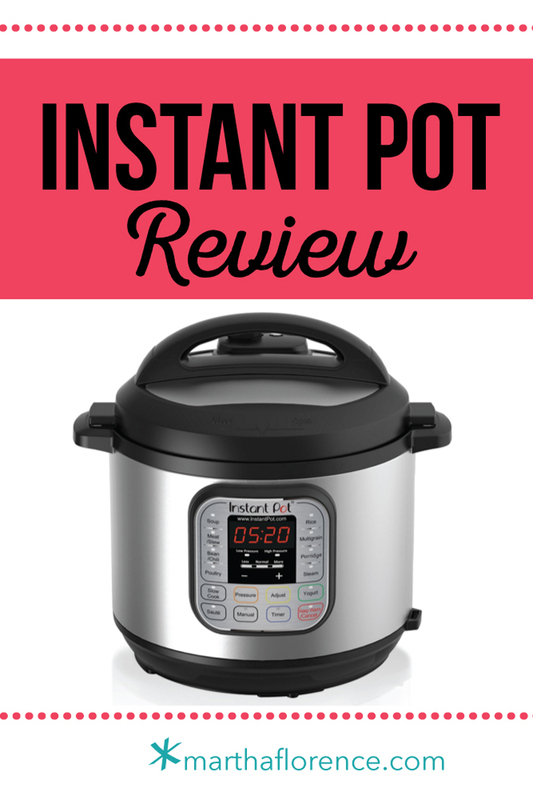 My Instant Pot has quickly become one of my favorite ways to cook. Stainless steel interior: Unlike the slow cooker and other pressure cookers, the Instant Pot has a completely stainless-steel interior. Parts of the exterior are plastic or other materials, these do not come in contact with the food and there is no teflon or non-stick surface. The stainless steel also makes cleanup a breeze. There's nothing worse than the endless soaking of the ceramic insert from the crockpot, but that's not an issue with the Instant Pot. It wipes clean on the first try and with relatively little elbow grease! Time saver: As I said before, I'm all about ease and efficiency, especially in the kitchen. It can cook a slow cooker recipe in under and hour (and it tastes better), this is super helpful on days when I forget to defrost something for dinner, or when we rush out of the house in the morning and don't have time to start a slow cooker recipe. My trusty crockpot has already been put out to pasture. Programmable: Regular pressure cookers and most slow cookers are not programmable. I have not used any of the programming features on my Instant Pot yet, because I can't plan that far in advance right now. However, since it cooks so quickly, you probably don’t need to start cooking right away, but you can put the ingredients in the Instant Pot and program up to 24-hours in advance so your meal is ready when you want it to be. The Price: This gadget usually runs around $100 (I've seen it as low as $78 and as high as $120, and Amazon always seems to have the best price). However, I find the price reasonable considering all that it can do and the convenience factor. Learning the ropes: At first, I was a little scared of pressure cookers in general and definitely intimidated by all the buttons on the Instant Pot. However, it only took me a couple of uses to get comfortable using it, but I definitely recommend that you read the instruction manual first before using it for the first time. The first couple of uses I did not find it intuitive, but I have quickly figured it out and now find it very easy to use. Lower pressure: Stove top pressure cookers typically operate at around 15 PSI, while electric cookers, like the Instant Pot range from 10-12 PSI. This is good from a safety standpoint as electric pressure cookers have built in feedback that makes them more efficient, but slightly slower than stove top pressure cookers. I have never used a stove top pressure cooker, but I think I prefer the electric version because it is easier to use and does not require constant monitoring. I almost feel like I could let my Instant Pot cook while I wasn't home. Almost.